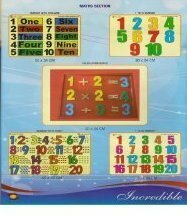 Providing you the best range of math section, english section, puzzle section, symbols tray, link block and transport section with effective & timely delivery. We are among the most prominent names in industry, involved in offering a huge gamut of premium quality Math Section. Math Kit offered is perfectly designed and developed on scientific concepts to make students understand the different learning concepts of mathematics. These are tested on various parameters these helps in losing inches in a faster and safer manner. 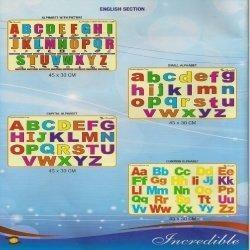 We are enlisted as a leading manufacturer and supplier of a large gamut of English Section. These valves are fabricated using premium grade raw materials and advanced technology methods that make them stronger and provide them longevity. These books include Introduction to Reading Comprehension, Writing Section, Dialogue Writing and Grammar Section. These areorganized in Question-Answer format with previous year solved papers as per IGNOU standard and other open universities. 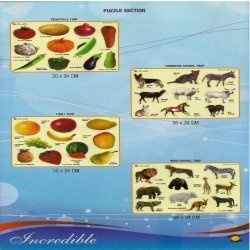 Puzzle Sections are one of the finest quality equipments which are specially designed and crafted in such a manner which makes it highly appreciable for physically challenged people. These are v you want. Show off your favourite photos. This is a great way to give someone a reason to smile. 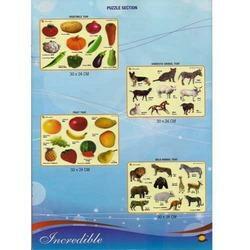 From the past couple of years, we are engaged in manufacturing, supplying and exporting, a wide array of Symbols Tray. These are high quality equipments are made by using very high quality raw material which ensures hassle free work performance at its user end. We have a team of immensely skilled and highly qualified quality controllers who keep an eye on each item to check and analyze them on set industry standards. Our esteemed and valued clientele can avail a wide array of highly durable and quality approved Link Block. Our range is manufactured using fine quality raw materials. 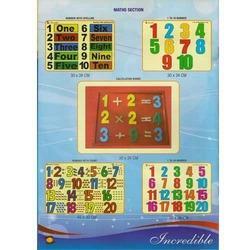 This helps in building hand-eye coordination, improve motor skills and helps enhance logical skills in the users. We offer our range at most feasible rates in market. Transport means: - 8 to 10 transport means in cutout form on 4 mm MDF board. The pictures shall be in attractive colours & easily identifiable with their names in Hindi and English. The 4 mm MDF board shall be duly adhered on 2.5 mm MDF board of size 30cm x 24cm. Each cut out picture shall be provided with duly affixed lifting knob (not using nails) for easy handling. Our community: - Major Job community like, postman, barber, police man, soldier, doctor, nurse, sweeper, potter, teacher & tailor in cutout form on 4 mm MDF board. The pictures shall be in attractive colours & easily identifiable with their names in Hindi and English. The 4 mm MDF board shall be duly adhered on 2.5mm MDF board of size 45cm x 30cm. Each cut out picture shall be provided with duly affixed lifting knob (not using nails) for easy handling. 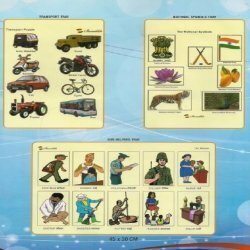 National symbols: - All the national symbols like- National Emblem, Flag, Flower, animal, bird, fruit shall be in cutout form. The pictures shall be in attractive colours & easily identifiable with their names in Hindi and English. The 4 mm MDF board shall be duly adhered on 2.5 mm MDF board of size 30cm x 24cm. Each cut out picture shall be provided with duly affixed lifting knob (not using nails) for easy handling. Domestic Animal: - The wild animals minimum 10 no. shall be in cut out form on 4 mm MDF board. The pictures shall be in attractive colours & easily identifiable with their names in Hindi and English. The 4mm MDF board shall be duly adhered on 2.5mm MDF board of size 30cm x 24cm. Each cut out picture shall be provided with duly affixed lifting knob (not using nails) for easy handling. Vegetable: - The vegetables minimum 10 no. like- Pumpkin, potato, tomato, peas, brinjal, cauliflower, bottle guard, carrot, okra, capsicum shall be in cut out form on 4mm MDF board. The pictures shall be in attractive colours & easily identifiable with their names in Hindi and English. The 4mm MDF board shall be duly adhered on 2.5mm MDF board of size 30cm x 24cm. Each cut out picture shall be provided with duly affixed lifting knob (not using nails) for easy handling. Fruits: - The fruits minimum 10 no. like- Apple, Grapes, Bannana, Pine apple, Mango, Orange, Strawberry, Papaya, Pear and water melon shall be in cut out form on 4 mm MDF board. The pictures shall be in attractive colours & easily identifiable with their names in Hindi and English. The 4mm MDF board shall be duly adhered on 2.5mm MDF board of size 30cm x 24cm. Each cut out picture shall be provided with duly affixed lifting knob (not using nails) for easy handling. Hindi matra ¼ek=k½: - All Hindi matra k ] f ] h ] q ] w ]&s ] &S ] ks ] kS ] Shall be in cutout form in different colours 8mm MDF board, the size of matra of q ] w ] &ss ] &S shall be from the section board of 8 cm x 8 cm , k ] shall be from 9 x 8 cm section board rest ks ,oa kS shall be from 13x 8cm section board. Under expert guidance of our professional and experts we manufacture and supply a wide range of World Building Educational Kit. Unique educational kits are the way to teach and reinforce basic phonic skills. 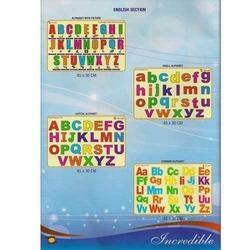 These kits are useful for making easy to form longer words and multiple-word combinations and sentences. One to Ten Number: - One to ten numbers in cut out form in different colours on 4mm MDF board shall be given. The cut out board shall be duly adhered on 2.5 mm MDF board of size 30 cm x 24 cm. Each cut out number shall be provided with duly affixed lifting knob (not using nails) for easy lifting. One to Ten Number with spelling: - One to ten printed numbers in cut out form & also in words infront of numbers printed shall be in different attractive colours on 4 mm MDF board. 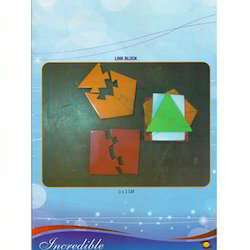 The cutout board shall be duly adhered on 2.5mm MDF board of size 30cm x 24 cm. Each cut out number shall be provided with duly affixed lifting knob (not using nails) for easy lifting. One to twenty number: - One to twenty numbers in different colours in cut out form on 4 mm MDF board shall be given with pictures according to the numbers. The cut out board shall be duly adhered on 2.5 mm MDF board of size 45cm x 30cm. Each cut out number shall be provided with duly affixed lifting knob (not using nails) for easy lifting. 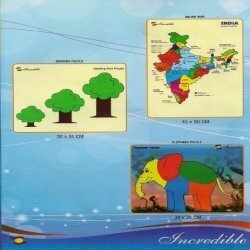 India Map (political): -The map in attractive colours of good quality shall be duly affixed on 4 mm MDF board. Each State/U.T. shall be named in English & Hindi with their capitals. The size of board shall be 45cm x 30cm. A to Z alphabets in capital letter: - All the alphabets in cut out form of different attractive colours on 4mm MDF board shall be given. 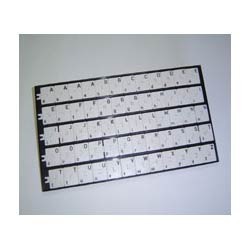 The cutout board shall be duly adhered on 2.5mm MDF board of size 45cm x 30cm. Each cutout alphabet shall be provided with duly affixed lifting knob (without nails) for easy lifting. Looking for Educational Charts ?